Fire pits are a beautiful, comfortable addition to any home’s backyard. Choosing the ideal firepit, however, takes some consideration. Gas and wood are two of the most popular firepit choices. We will explain the differences between them to help you make a more informed decision on which might be better suited for your backyard. Gas fire pits work with liquid propane 1 or natural gas, while wood fire pits require the use of dry wood. Due to having to hold large logs, wood fire pits tend to be larger than gas fire pits. For both types of fire pits, it is important to know that you have a supplier for the fuel. Wood fire pits need good firewood, while gas fire pits require the use of a natural gas or propane 1 supplier. Having easy access provides a simple way to keep your fire pit going. Storage is also something to keep in mind. Wood fireplaces need a spot to hold all of the wood. You have to ensure that it stays dry, and it must be away from the home because wood can hold termites. On the other hand, gas fire pits need a large storage tank for the gas it requires to run. Companies provide containers from 15 to 100 gallons. Keep in mind that this tank is not going to be attractive, so consider a landscape plan that will hide it. A gas fire pit is much more efficient at lighting and providing continuous heat. There is generally just a button that needs to be pressed to light the flames. On the contrary, a wood fire pit requires the effort of building a fire. Once a larger wood fire is going, though, it can put off continuous heat for some time until a new log is needed. Gas fire pits are always going to be the more energy-efficient. 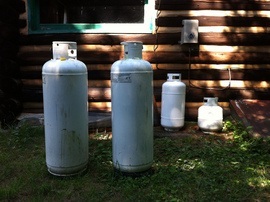 Gas burns more cleanly and produces fewer emissions into the atmosphere. Wood fire pits emit around 28 or more pounds of emissions into the atmosphere every time they’re used. This is compared to natural gas, which produces 99 percent fewer emissions than that of the wood fire pit. Gas fire pits are harder to install. Since gas lines need to be run for the fire pit, it requires the use of a professional, and this also means it needs more time to be installed. Wood fire pits can be a DIY project, but it is recommended that a professional build a fire pit for safety reasons. However, even with the longer installation of gas fire pits, they do not require the time you’d spend stacking, ordering, seasoning, and carrying all of the wood needed throughout the year for a wood fire pit. Once the gas fire pit is installed, you do not have to do anything else but press a button to start it. 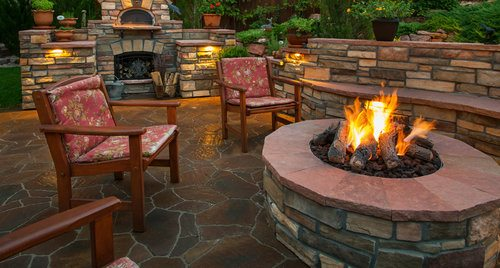 The installation from professionals differs since a wood fire pit requires only a metal frame, brick or stone over top of that, and be a specific distance away from the home. A gas fire pit has fewer rules to follow, but the gas lines that go to the fire pit have to be installed correctly and out of the way of those walking through the yard. The cost of a wood fire pit varies depending on the specifics such as the type of stone or brick on the outside of the fire pit. The cost of materials can range from $300 to $800 or more. Installation generally runs around $50 to $60 an hour, with a fire pit being installed within a day, costing $200 to $500. The total cost of a wood burning fire pit is between $500 to $1,300, depending on the final touches the owner chooses. Gas fire pits vary depending on the specifics as well, such as the type of materials, size, and placement. The costs of materials range from $400 to $3,000 or more. Installation for a gas fire pit usually runs between $500 to $800 depending on the difficulty of the gas line. The total cost for a gas fire pit is much higher initially, coming in between $900 to $3,800. Wood fire pits are harder to maintain because they hold the soot, ash, and logs. This will need to be shoveled out from time to time. Creosote may be an issue with wood when it is burned since it is a tar substance that can leak harmful chemicals into the air. When breathed in, they’re not good for the health of those nearby. Additionally, unclean wood fire pits can produce a fire if the embers are not put completely out. In comparison, a gas fire pit does not require much maintenance at all. Since it burns clean, with no logs or soot, there is nothing to clean out. The outside of the fire pit can be wiped down, and a cover can be placed over it for when it rains or snows. The experience that a user has with a wood fire pit is much different from that of gas. Gas fire pits do not leave odors on clothes when used. Wood-burning fire pits have a distinct smell and provides a natural experience with the sound of the logs crackling, which are two reasons why someone would choose wood over gas fire pits. It is always important to have the gas system checked thoroughly for any leaks that might occur. If a leak happens, things can quickly get out of hand. To avoid this situation, keep the fire pit in the best shape and have routine maintenance performed on the gas lines. Wood-burning fire pits also have to be used with caution. Make sure that the fire is completely out each time. It should also be away from any structures that can catch fire. Wood is a renewable resource that is ideal for the environment, but gas is the cleaner choice. The impact that wood has on the environment is not as good as gas, but this also means that the gas is cleaner and better for those users to breathe in, especially those with asthma. The particles from the wood can cause problems for those with breathing issues. Local ordinances may prohibit open burning within fire pits. Some areas have a burn ban that is in place at certain times of the year. This only covers fire pits that have open, wood-burning flames. Additionally, any fire should be placed away from any structures in the backyard. This must be done to reduce the chances of having a fire that doesn’t stay inside the pit. Some areas or neighborhoods may require a permit to have any fire pit on the outside of the property. It is important to check your local laws. How much does it cost to install a wood-burning or gas fire pit in my city? Cost to install a wood-burning or gas fire pit varies greatly by region (and even by zip code). To get free estimates from local contractors, please indicate yours.